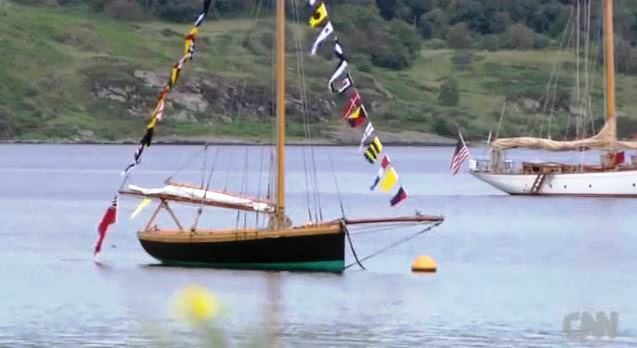 Ayrshire Lass, designed William Fife Sr, 1887, dressed overall in the Kyles of Bute, Fife Regatta, July 2013. It was our pleasure last year to assist CNN Mainsail’s Richard Simmonds and double Olympic gold medalist, Shirley Robertson, with their superb coverage of The Fife Regatta 2013, now up at YouTube. Their desire for accuracy and attention to detail in honouring beautiful Scottish yachts, and their makers, was right up our street. In Part One, Shirley sets the scene with the help of Fife family descendant and biographer, May Kohn – who writes as May Fife McCallum – and members of the Peggy Bawn Press team, Iain McAllister and Theo Rye, who took part in the regatta aboard the unique gaff cutter, Ayrshire Lass, designed by William Fife Sr (or “II”), built originally at Fairlie in 1887 as a “24-foot sailing boate” and rebuilt by Peggy Bawn’s restorer, Michael Kennedy, at Dunmore East, County Waterford, Ireland in time for 2008 Fife Regatta. Part Two follows the superb 1908 cutter, Viola, and her Breton crew on the stormy passage race from Largs to Rothesay. And the sun came out for Part Three’s scenic cruise up the Kyles of Bute aboard Ross Ryan’s elegant and fast, gaff-rigged 1910 8-Metre, The Truant. The William Fifes, Sr and Jr, were great friends and rivals of Glasgow yacht designer George Lennox Watson, the subject of Martin Black’s beautifully illustrated biography, G.L. 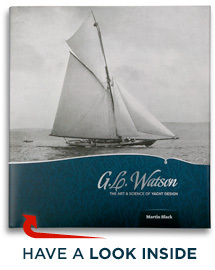 Watson – The Art and Science of Yacht Design, available to purchase online at our website www.peggybawnpress.com, from Amazon UK and Amazon USA, and from the bookstores listed here. This entry was posted in America's Cup, archives, art, boatyards, book, Clyde yachting, film, Firth of Clyde, G.L. Watson, Glasgow, journalists, naval architect, object of desire, other yacht designers, yacht design, yacht designer, yacht racing, yachting history and tagged Astor, Ayrshire Lass, Denny, Ellad, Fife Regatta, Kentra, Latifa, Mignon, Saskia, Shamrock III, Sir Thomas Lipton, The Truant, Viola, William Denny & Bros., William Fife & Son, William Fife II, William Fife III, William Fife Jr, William Fife Sr. Bookmark the permalink.